University of Washington juniors Noah Dickerson and Matisse Thybulle and freshman Jaylen Nowell earned accolades from the Pac-12 Conference. The Pac-12 Conference Monday honored a trio of University of Washington men’s basketball players, naming junior Noah Dickerson to the All-Pac-12 first team, junior Matisse Thybulle to the league’s all-defense team and freshman Jaylen Nowell All-Pac-12 honorable mention and to the all-freshman team. Dickerson, a native of Atlanta, earned first-team honors after averaging 15.4 points per game, up from the 12.4 he posted last year as a sophomore. Dickerson recorded nine of his 15 career double-doubles this season with six of the nine in Pac-12 play. Dickerson has three of his career five 20-point/10-rebound double-doubles this season. That’s the most since Matthew Bryan-Amaning had eight during his career (2007-11). Dickerson recently became the 39th 1,000-point scorer in UW history. H has 1,115 points, 32nd on the career list. Following Washington’s sweep of No. 25 Arizona State and No. 9 Arizona, Dickerson was named the conference and NCAA player of the week. He is the first forward at UW to earn first-team honors since Bryan-Amaning in 2010-11. Thybulle, a graduate of Eastside Catholic High School in Sammamish, has been a force on the defensive end in coach Mike Hopkins’ 2-3 zone, setting the UW career record in steals with 196. He also moved into the UW career top 10 in blocks with 98. He is the only player in program history to be in the top 10 in both categories. He is also sixth in Pac-12 history in single-season steals with 92, which is 18 off the Pac-12 record and is the UW mark as well. In the past 25 years, Thybulle is one of three Pac-12 players to post more than 190 steals and 90 blocks in a career. In addition, he is only the fourth player in UW history to earn all-defense honors, joining Aziz N’Diaye (2011), Justin Holiday (2010) and Venoy Overton (2010). He has started in every one of his 96-game career, and has a streak of 43 consecutive games with at least one steal. Freshman Nowell leads UW in scoring at 16 points per game, leading the team 13 times. He has nine 20+ scoring efforts, including 32 in his season debut, a freshman record. Nowell had 16 consecutive games of at least 10 points and 28 overall with 10 or more points in 31 outings. 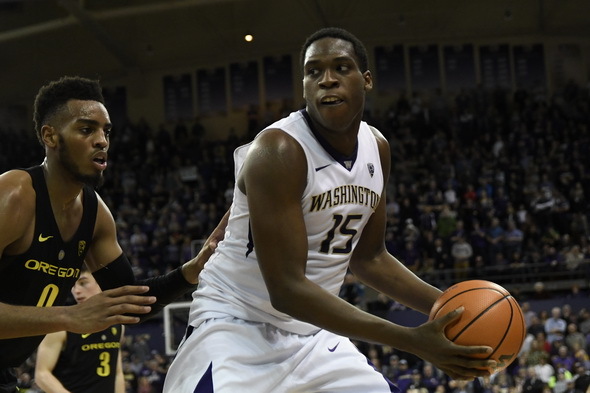 The Garfield High School grad is fifth on the UW freshman list in points with 497, 82 off the UW record for a freshman. The No. 7-seeded Huskies open the Pac-12 tournament in Las Vegas against 10-seed Oregon State Wednesday at 6 p.m. (Pac-12 Networks).